"Whats so great about nuts that are dead?...!.. " Jesse James loves his Bluco Demmeler model Welding table. Listen to Jesse James explain how his Bluco weld table expands his mind. No really. .. Jesse James really said that. And to be honest, I can relate. I might even be persuaded to give my left testicle for this table. Which brings me to this, I especially can relate to Mr. James’ use of the term “dead nuts” to describe the motorcycle frame being straight or plumb. Mr. James has a bike frame all clamped in place and indexed with the upright block locating the angle of the neck. 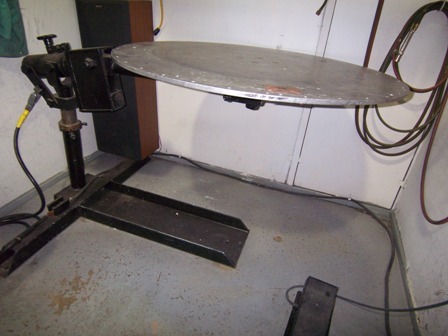 Anyway, if you had a welding table like this, there is practically nothing you couldn’t do. Compound angles, cantilevered brackets, chopper frames, home built chromoly tubing airplanes, you name it. Holding things straight would not be a problem. It is pretty beefy too. So it could be used to straighten stuff that is crooked. But the price is a big problem for me. I thought the smaller Stronghand tools pro built table was pretty expensive at $2199 for a 48" x 36" model. But $2199 actually seems like a bargain compared to the Bluco Demmeler model that Jesse James likes. if you want to learn more about the stronghand tools precision welding table that is priced for the working man, just click on the Northern tool link below and then search for stronghand welding table. the options for a welding table are endless... But you have to start somewhere. And remember this, what you start with, does not have to be what you end up with. •	If you are planning on only light duty occasional welding, you can get a sheet of aluminum or steel and put it on top of a wood work table or sheet of particle board (it's flatter than plywood). You can’t really clamp anything to it very tight or heat anything with a rosebud, but in a pinch, it works for really light duty tig and mig welding. •	And while on the subject of light duty welding, if you are kind of cramped for space, or if you tig weld small parts, just buy a foldable table from northern tool that you can hang on the wall when you are done to get it out of the way. •	Search your local craigslist.com for a readymade welding table. You might even be able to get it delivered. I just searched my local listings and found a few really good deals. The cheapest was around 200 dollars but it was a 3ft x 9ft with a 9/16 thick steel top, frame was made of 4in x 4in box tubing with 4 1/2 in round tube legs. table is 34in tall…that’s a lot of steel for 200 bucks…and its done…ready to weld on. ..and practically for the price of scrap iron. 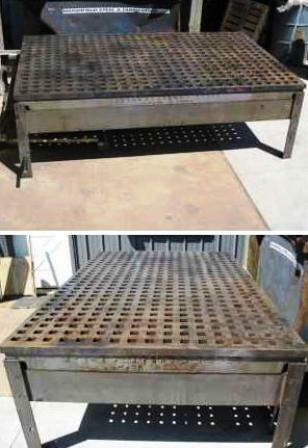 •	If you routinely weld small stainless steel parts for the food service industry, you can buy a stainless steel food table that will work great for a really clean welding surface that wont make your stainless steel parts rust from the iron particles you will pick up from a carbon steel table top. (this is a code requirement by the way, if you weld food service stuff for restaurants or food processing). 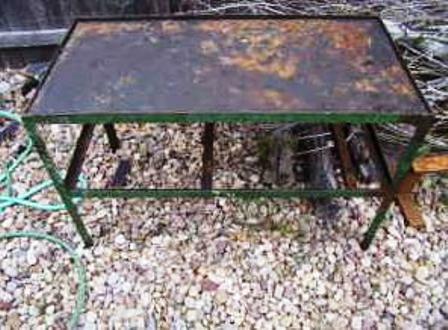 •	Order the steel yourself and make your own steel welding table for around 800 bucks and several hours of work. 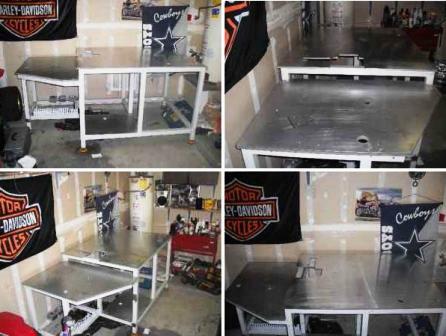 •	Pay the big bucks and get a Bluco welding and fixturing table like the one Jesse James pimps in the video above. If you are just starting out , are cramped for space, and just bought a 115 volt mig welder, or a small tig welder, then go with the foldable table that you can hang on the wall. Even when you outgrow it, it will still come in handy as a portable work table, or even a sawhorse. When you do outgrow it, you will have a better idea of what you want or need. The good things about a cast iron acorn platen table is they are strong, flat and dont warp. You can get the cast iron pyramids too for cutting with an oxyfuel torch. You can find a light duty welding table like this on craigslist for about a hundred bucks. 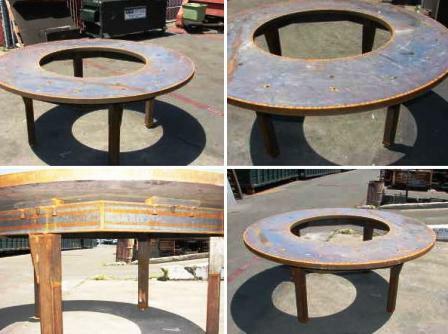 Round welding Tables are good for round parts. If you need a really strong and flat table that you can burn on...A cast iron platen is good. 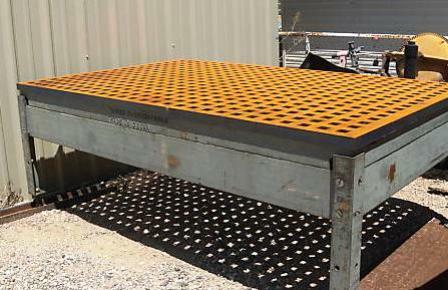 An aluminum top welding table is great for welding stainless or polished parts. 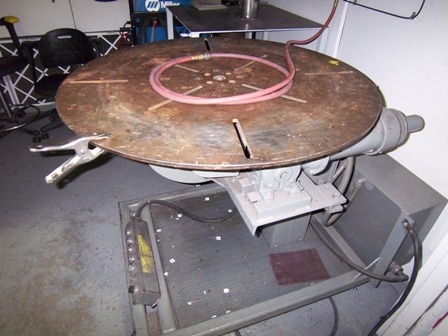 a welding positioner makes a very useful table for odd shaped parts. A motorized welding positioner is great for round or heavy parts that need to be rotated for welding. “Although Bluco solutions will often not be the least expensive option, it is entirely possible to get started with a system for a much smaller initial investment than the one mentioned previously. Our rent-to-own and lease-to-own programs both eliminate the requirement for a large capital investment, and our rent-to-own program removes any risk by allowing you to try the system in your facility without a significant capital investment – if it doesn’t work, send it back; if it does work, convert to a purchase. If you want to see the system in action first, then bring your parts to our validation center, and we will design your fixture, assemble it, and weld your parts so you can see our system working – all free of charge. Consider the fact that many of our customers see a 2-4x increase in their throughput (yes, we’ve gotten that feedback from many customers), and suddenly the system is actually paying for itself pretty quickly. Investing in a Bluco system brings with it significant benefits, such as a limited lifetime warranty and a lifetime exchange program; free on-site training to help you optimize your use of the system; free unlimited technical support; free initial fixture designs to help determine the best components for your application; free CAD database to help you design your own fixtures; and on-going fixture design services are available.